The voices of daybreak around Hoe & Shovel are typically dominant with high-pitched screeching of many red-shouldered hawks flying about searching for breakfast in and out of the tall cypress trees. Often we hear the rich, loud, rattling call of the sandhill cranes as they fly over to nearby water areas for their morning hunt. Yesterday's dawning brought the same welcome voices only with the addition of a loud honking sound. 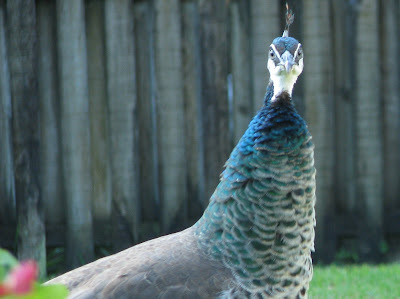 Before the bevy of peafowl were spotted in the back yard they were heard. First, at a distance but I could tell they were not too far away in the neighborhood. One of their calls sounds like a quickly tooting horn. I don't know how else to describe it but it is unmistakable. They have many noises and calls. All of which are undeniably loud and unique. Peafowl are the largest members of the pheasant family. Hearing the sound of a peacock is kind of familiar. Not too long ago, there was a peacock that lived across the street for a while. He would sit atop the neighbor's roof and toot his horn often as well as cry out his mating call. I liked hearing it but I must admit I often commented to hubby how glad I was that it wasn't sitting on our roof all night. They wake up really early... much like a rooster letting the whole world know it's time to get up. That particular one hasn't been there for several months now. 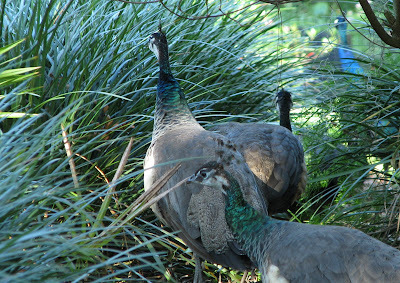 My camera was nearby when I spotted a group of peafowl strutting along the foliage behind our screened lanai. I attempted to get around them in order to photograph them but they were not keen on my stalking ways and fastly scurried over to the next yard. It was nearly impossible to get a good photo. I took lots of bad ones. The male peacock that used to live across the street was prone to occasionally wander over here and take a little perusal through my yard without too much harm. Sometimes his six-foot long tail feathers trailing behind in tight spots did more damage than what he ate. 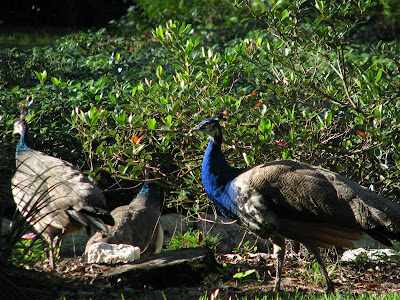 Yesterday there were five peahens and peacocks altogether. Although no males with the long tail feathers among them. It takes 3 years for them to develop the long regal feathers they are famous for. They are grub, snake, insect, small animal, flowers, and green grass eaters. I've read that they can mow down a garden in short order or leave it alone depending on their mood. They are mostly ground foraging birds as they are not great flyers. After my chase for a decent photo I spent my day in the garden. I saw they wandered around next door for a while. Over the course of a couple of hours I heard them at a distance a couple of times. But I never saw them again and I haven't seen them or heard them today. That doesn't mean they won't be back. They are probably living somewhere close by. Even though I don't really want them eating my flowers (too bad it isn't slugs only they eat - I'd be inviting them over for dinner) I am certainly intrigued by their size and magnificent coloring. Both males and females sport that regal crest upon their heads. There were many more critters in the garden with me yesterday. I'll try to post some of them later. I have never seen them in the wild. In Victoria, Canada I saw a small group in a garden. They did seem to live there. I also have seen them in zoos. Good afternoon Sherry, Yes, the sight of them traipsing around is magnificent. Peacocks molt and that's when their feathers drop off... so I've read. People raise them and then sell the feathers as this process occurs. Oh my!! We recently had a lonely male peacock in our area. He started calling for a mate at 3:00 in the morning, every morning for about a week. It sounded like he was calling HELP, HELP over and over and over. While it was really cool seeing him way up in the trees each morning with his long tail feathers hanging down behind him, I have to admit that I wasn't disappointed to see him leave. Looks like you got some great pictures to me. I'm such a bird lover and those are really pretty. Greenjeans: Exactly... very early is 3 a.m. and that Helllllp Helllllp call is VERY piercing. I could see the one across the street on the roof of our neighbor's from anywhere in my front yard. But I could hear him from inside my house. He was rather statuesque with his feathers hanging halfway down the slope. We were far enough away that it never woke us up but the neighbors to the right and left were not so fortunate. They were all happy when he left. Susie: I know what you mean. Birds of any kind are quite fascinating. Birds of this size are just plain remarkable. Beautiful birds! I've never seen them, except at the zoo. Thanks for posting these lovely pics. The birds here in FL never cease to amaze me. When I was with my friends last week they kept asking me the names of all the different birds we saw. I kept wishing you were there to help. :) Thanks for sharing your pics. 3 am. we have several places where they seem to always be. they are wonderful to look at but not so great for the sleeping aspect. i do love the captures you got, too. don't you feel like you had royalty saunter by for a regal visit? awesome! i mean, hawks, redbirds, etc, are really interesting, but these sophiscated creatures wandering around in your garden, like kings and queens putting a stamp of approval on your creation of beauty and elegance - now that is a real treat! i would love to have witnessed the procession! I can just imagine hearing these birds vocalizing at 3a.m. Not a good thing. It is fun to see them passing through the garden. I didn't realize they ate flowers etc from the garden. I thought they ate bugs and small mammals mostly. I have seen them kept as pets at a couple of rural homes around here. It is always alarming to hear them screeching when you drive by. Like you say an unmistakable call. I envy you with all that wild life around. Are there any houses for sale in your area? LOL I know the feeling about the roosters crowing. I was visiting some family in Grenada and spent the night in St. Andrews. I had arranged for a taxi to pick me up at 6.00 am the following day. So I went to bed and put my clock to alarm at 5.00 am. Well I knew the roosters were sleeping in the trees around the property and said to myself at least they will wake me up in the morning if my alarm fails. I fell asleep and was awakened by roosters crowing and I thought that my alarm failed. I also though that dawn had arrived too quickly. I jumped out of bed and prepared for my departure. When I had finished showering in ice cold water (they had no hot water) and dressing, I went into the patio and waited on the taxi. I waited for what I thought was a half hour and wondered why was the taxi taking so long. I then decided to look at my watch. It was 3.00 am! I wanted to kick myself and shoot every rooster. I undressed and crawled back into bed and slept fitfully until 5.00 am and started all over again. At least I didn't have to take another shower! Hi...These birds are something else! Beautiful and odd! I have heard the cries and sometimes the screetch is very loud, having them perch on the roof could be an adjustment! So glad they live down the road from your house! You can enjoy them and not be didturbed early in the mornings. That's exciting! That blue on the neck is so pretty. How interesting. I saw a brief spot on the national news about them. Seems some people in Florida really don't like them and resent the people who feed them. I was wondering about their egg-laying habits. Do they build nests in trees or do they lay eggs on the ground around their foraging areas? Do you know? Maybe they were spying out their future Spring habitat? They sure are pretty! Last time we were in Tarpon, I missed seeing them, but I heard them somewhere back in the woods. The first pic... that look! Priceless! LOL! 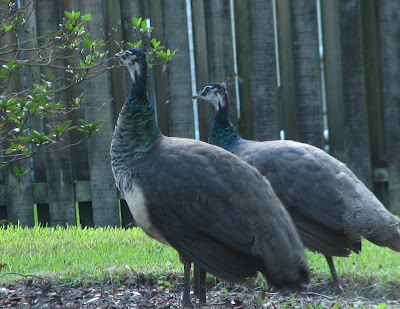 I love the look of peacocks roaming the lawn - but I've been afraid of their size (and what they might leave behind, if you get my drift). What wonderful visitors! Meems, I learned something! I didn't know they were related to pheasants. 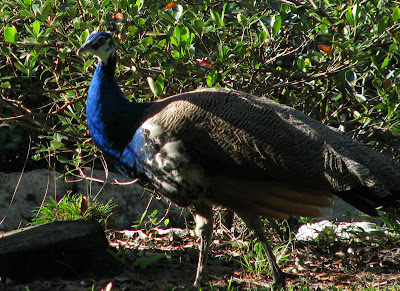 Peafowl have always fascinated me, from their iridescentplumage to their haunting sreeches. I would ceratinly feel privledged to have them stroll through my gardens. Meems thank you for the info about the peacocks. I had once a couple resident for about a week. I don't know where they came from. In the beginning I thought I hope they stay...but...after a week I was glad when they left and did not come back. I must say I like their mournful call. You hawe some beautiful wisiters in your garden. Lucky you. But I can se why you dont want them to stay to long if they are eating of yoyr plants.